The Railway sadly have to announce the passing of Kevin Cox who has undertaken work for the Railway for many years. Kevin repaired the drystone walls that flank the Railway from at least 1981 until he became too ill to undertake the work about 18 months ago. member and took the Railway’s PTS course. Kevin’s funeral service will be held in Long Preston on Monday, 24th November and as a mark of respect, a wreath is being carried by the steam service locomtove this weekend. It is with great sadness that the Railway’s Chairman, Matthew Stroh announced today that he had received the news last night that Keighley & Worth Valley Railway member number 2, Vic Benson, has passed away. The Railway would like to express their condolences to his family and friends, as well as to fellow members who worked with him in the earliest days of the Railway. The funeral service will take place at St Pauls Church, Shadwell, Leeds, at 11am on Wednesday 12th March and then afterwards at the local Village Hall. As has become customary at such times, the Railway will attach a wreath to a locomotive in his honour at the earliest opportunity. With the advancing years of many of our founding members, the Railway is receiving such bad news more frequently. As always, the Railway is forever grateful to the founding fathers of the Railway, without whom none of what we see today would be possible. Although Mike Goodall passed away almost 4 months ago, it was not possible to lay him to rest as he had no known close relatives. However through the efforts of the Coroner’s office and with some help from the Railway, a will was found in the past couple of weeks, and finally, today, a number of the Society’s officers were able to pay their, and the Railway’s, last respects as Mike was finally laid to rest at Rawdon Cemetery, Leeds today. A full tribute to Mike will appear in the Spring 2014 issue of the Society’s magazine, Push and Pull. The Railway sadly have to announce the passing of long-serving safety officer Michael Goodall of Leeds. Mike served the railway for 47 years but lost his battle with cancer at the age of 75 on 29th September 2013 and, as a mark of respect, a wreath was carried by a train the following weekend. On the 9th October 2013 the Railway lost one of its staunchest supporters, with the announcement of the passing of Chas. Meredith at the age of 80, in his native Dublin. 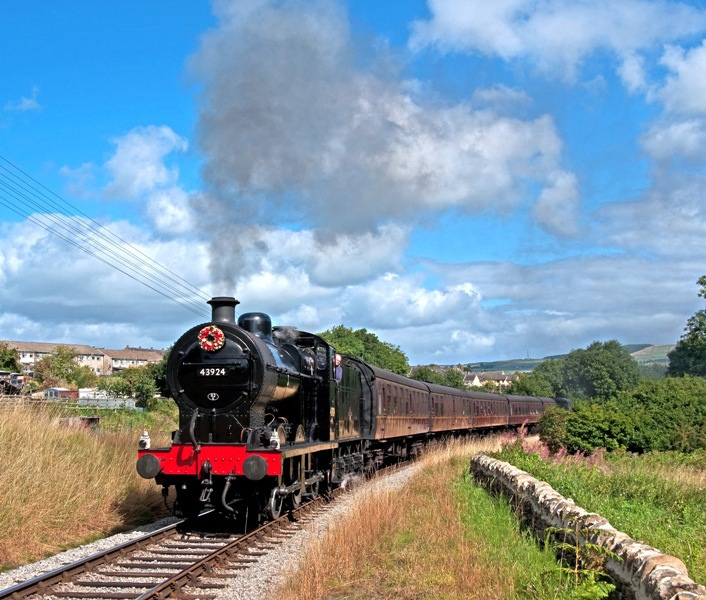 Having spotted the Railway from his airline seat, he sought out the Keighley & Worth Valley Railway and established contact, initially being put in contact with fellow solicitor Richard Greenwood, part owner of ‘City of Wells’. The result was that Chas. eventually became a valued member of the ‘City of Wells’ mainline support crew throughout the 1980’s and became a major shareholder in 34092’s support coach. In addition he was a leading light in the Railway Preservation Society of Ireland back home in Dublin. Meredith not only had a great passion for steam railways but was great jazz aficionado, being affectionately known as the voice of Irish jazz playing several instruments to a professional standard. Our condolences go to his wife and family. On the 29th August 2013 the Railway lost one of its long-serving characters, Chris Bray, known affectionately to his close friends as ‘Trotsky”. Chris lost his battle with ill health and passed away at Manorlands Hospice shortly after his 63rd birthday. Indeed, the previous Saturday he had enjoyed celebrating his birthday with one final journey on the Railway, a journey he had looked forward to and enjoyed so much. Full tributes to Chris appeared in the Winter 2013/2014 issue of the Society’s magazine, Push and Pull. On the 31st August the engine rostered for the day carried a wreath in his, and fellow Worth Valley volunteer David Howitt’s, memory.